If you have been reading my blogs for some time you would know how much I like coconut. Both for desserts and for curries. Most north Indian curries and UP style curries never use coconut and the gravies are darn brown to, light brown to creamy white or red in color, owing to various degrees of bhunoeing the masala, caremalising the onions and quantity of tomatoes. And then I see those curries of many of our southern states where you just stew the vegetables or meats with a coconut based spice paste. Believe me, I did not grow up eating them but those coconut based curries ahve become my comfort food since I started cooking them at home. 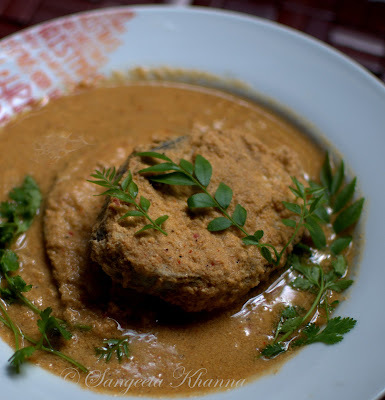 This Malwani fish curry is one of those stewed curries where you don't have to bhuno the masala and deglaze it till it releases oil. And there are no exotic ingredients involved. But yes, since I had some Tirphal that Rekha had gifted me some time ago when she brought it from Goa. 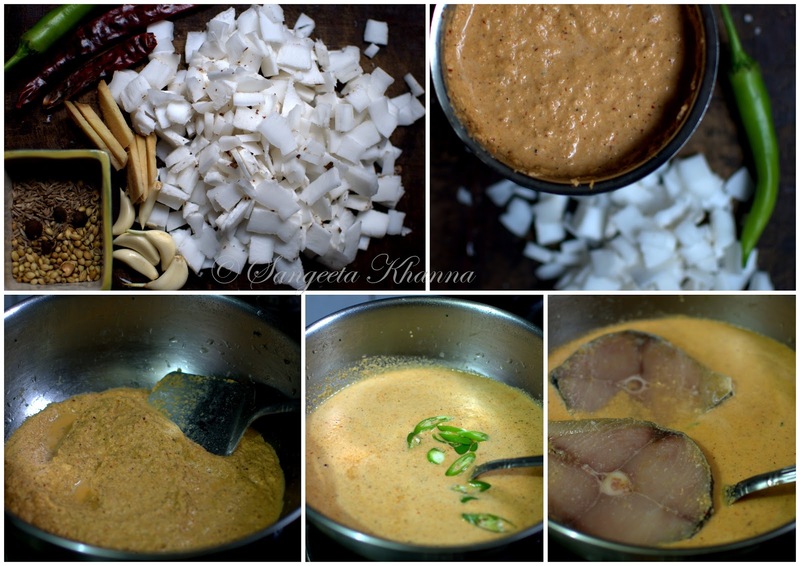 This peppery spics has a nice depth to it's flavor and adds a unique touch to this Malwani fish curry. My recipe is based on this description of Goan fish curry where there is no use of Tirphal. Make a paste of the above ingredients just like the picture collage and pout the paste in a pan. Add the chopped green chilly to this paste and let it simmer for about 5 minutes. If you want the gravy thick and smooth you can sautee the above mentioned chopped onions and then add this past and simmer. Some coconut milk can also be added to enrich the flavors. Add the fish steaks in the simmering mixture and coat them all well. Simmer again for 8-10 minutes with cover , add the curry patta and coriander greens and take the curry off the stove. Do not add the fish steaks before cooking the coconut and spice mix as this can cause splitting of the gravy. Though it does not alter the taste but he curry might look a bit curdled. Nice recipe. Can I use any fish or some particular fish only? And does it affect the taste too much if Tirphal peppers are left out? I agree about coconut. I have also started using it in recipes since I started living in Bangalore. Before that I used to wrinkle my nose at it :). Black pepper works fine for the recipe too Rachna. I wanted to use Tirphal as I had it. 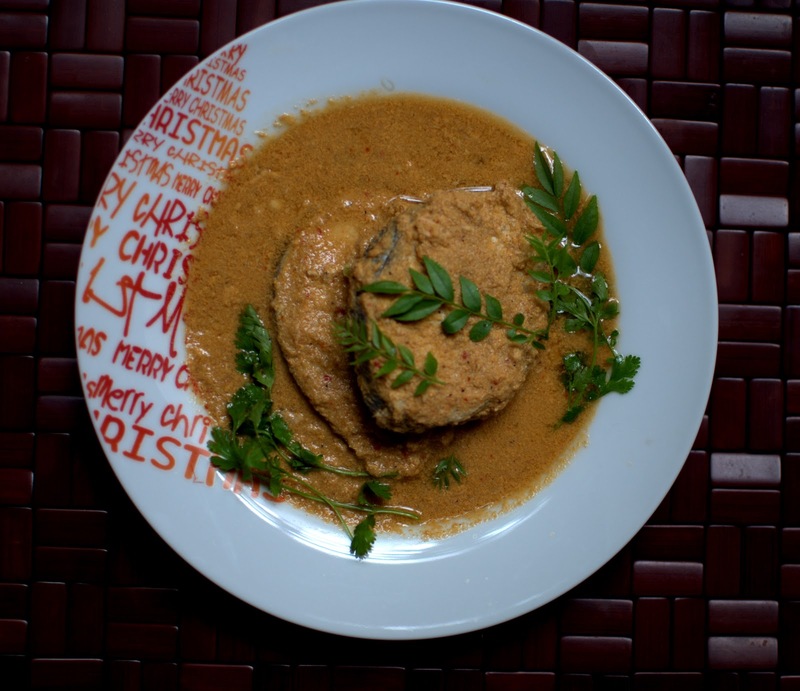 And traditionally they use Pomfret for this curry, any fish is good in my experience though. Will bring some Tirphal for you Varsha. Try this. shd we not half fry the steaks ? Half frying can be done and the coconut gravy wont curdle in that case. I like the poaching better for the ease of cooking and thats how the original recipe also mentioned.